Zucchini season will soon come to an end, but there’s still time to enjoy this icon of the summer garden. We’ve made salads, pasta, bread, gratins, and all sorts of things with zucchini, even though it was a sad zucchini year for us after losing all our zucchini plants to garden pests. Risotto is comfort food for me anytime of the year no matter what I put into it, and this one with zucchini and our fresh homegrown basil and garlic does not disappoint. The Grana Padano cheese adds a slightly nutty yet delicate flavor that is worth the search, but you can also substitute Parmigiano Reggiano if you can’t find Grana Padano. The recipe is adapted from My Italian Garden, by Viana La Place (in my personal collection), a lovely little book with watercolor illustrations based on cooking from her own Italian garden in San Francisco. The book is divided into seasons, making it perfect for cooking with seasonal produce. This is my contribution to Grow Your Own, the blogging event that celebrates the dishes we create from foods we’ve grown, raised, foraged, or hunted ourselves. Praveen of Masala Heaven is our host for this round, so be sure to visit her blog for more information about submitting your post. If you are new to the event, you can read more about the rules for participating at the Grow Your Own page. I hope you will join us! Adapted from My Italian Garden, by Viana La Place. 1. In the 2-quart sauce pan, bring the vegetable broth to a simmer. Keep it hot but not boiling. 2. In the 3-quart sauce pan, heat 1/4 cup olive oil over low heat. Add the onion and sauté slowly until soft. Add the zucchini and garlic and sauté over medium heat for 2 to 3 minutes. Add the rice and stir until the rice is translucent, about 1 to 2 minutes. 3. Reduce temperature to low. Add the hot broth to the rice mixture one ladleful at a time, stirring frequently. Wait until the liquid is absorbed before adding the next ladleful of broth. Midway during cooking, add the basil and salt and pepper to taste. Continue cooking until all the broth has been added. 4. Test the risotto to make sure it’s al dente, but not too hard. If it’s still a little crunchy, add a ladleful of water and continue stirring. When risotto is ready, remove from heat and stir in the remaining 2 tablespoons of olive oil and the Grana Padano cheese. Serve immediately. Indeed risotto is comfort food! I think the effort that goes into making risotto, constantly stirring for 30 minutes straight, makes it that much more comforting. Thank you for the link, my dear! Delicious! Your risotto looks perfect! Very nice! I just posted almost the same dish on my blog 2 day ago, only my basil was purple. 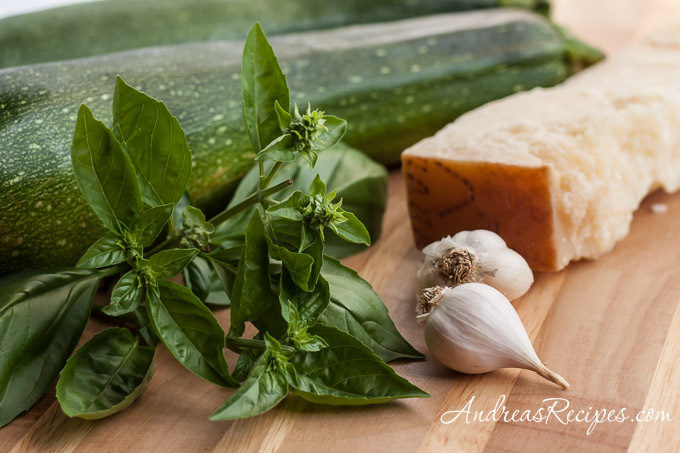 And everything was homegrown – onion, cucchini, basil and even garlic. YUM! What a great recipe to welcome the fall! Anything with the word Risotto in it sounds so comforting! Wow. This looks great! I’m a sucker for risotto, so I’m always looking for new recipes to try. Your risotto looks creamy and perfect. I just made my own porcini risotto the other night. 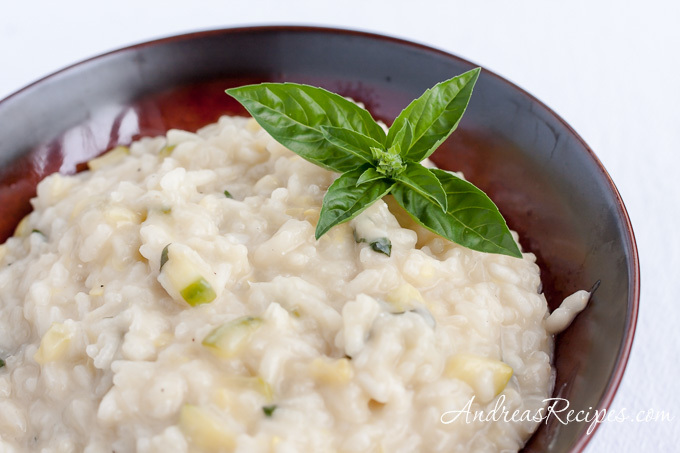 Love the idea of zucchini risotto! This looks lovely. I so would like a bite! Like the new(er?) portrait shot. Am inspired by the risotto recipe. Now that temps have finally dropped here (relatively speaking anyway) I am thrilled to consider the addition of some warm comfort foods in our dinner roundup. With zuke leftover from a bread baking project, this might be just the ticket to use it up in an unexpected way. Thanks for sharing. Wow, the dish sounds amazing, but your photos take it to a whole other level! Beautiful. Looks like you nailed the risotto! Well done. Yum – I am such a sucker for a good risotto. And if I can use up some of these zucchini? I’m in. Looks delicious. I see what you mean by comfort food. This risotto looks so creamy and satisfying – comfort in a bowl. I love risottos! My favorite way is to make them in my pressure cooker. This recipe looks intriguing – for some reason, I would not have thought to put basil in, but now that I read it, it sounds perfect. BTW, love the new blog design, I would love to hear more about how it came to be! Maybe I will see you at BlogHer Food?